I'm pleased to report that the headache I've been suffering for the last few days has finally gone. 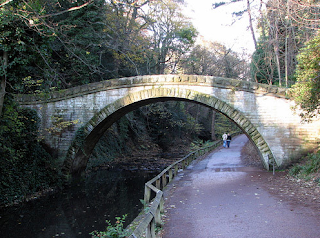 Even more pleasing is the fact that I managed some inclines in Jesmond Dene today during a 6 mile run. The conditions were very hot and humid indeed. Thanks to my training in Egypt a few months ago this was no problem whatsoever. Almost the entire surface in the Dene was slippy underfoot. It was good practice for Saturday's 20 mile Chevy Chase run. Speaking of which, I had a bad dream about that particular run last night. The dream was all about not taking any water with me for the course and instead opting for speed due to my reduced payload. Madness! I don't tend to do that many ogranised races but when I do I tend to get very nervous for one reason or another. The Blaydon Race, for example, had the pressure of wanting to run a sub 50 minute time. Next year I'll be gunning for a sub 45 minute time and the nerves will no doubt re-appear. The pressure of the Chevy Chase is simply to beat the cut off time of 6 hours and be recognised as a finisher! Simple really! I've had a headache since Friday evening which has meant I missed a run at the weekend and a session in the gym tonight. It seems to have gone now, thankfully. I've got a feeling it was linked to dehydration. I do seem to be drinking a heck of a lot at the moment but still feel very thirsty. Perhaps it's something to do with the increase in temperature. Who knows! The good news is that I'm desperate to go for a run tomorrow and will be doing 2 or 3 short easy runs before the Chevy Chase on Saturday. Monday 22nd June - Personal Training Session. (01:30:00). Tweaks to the training schedule imminent! The last 8 months have consisted of alternate weeks of running and cross training. It's a nicely balanced schedule which has worked really well up to now. It has allowed me to run almost 1000 miles so far while being able to fit in work and family life. The results, so far, are there for all to see or read about. I'm running faster and further than ever before and I've lost count of the number of PBs I've managed over the last few months. It's all good stuff and is slowly but surely getting me where I need to be as I prepare myself both physically and mentally for the toughest challenge I have ever faced in my life. While I'm quite happy with the current schedule, I feel the time is right to make a few tweaks to it. I suppose "tweak" is the wrong word as the changes I'm proposing could be seen to be pretty major. Firstly, after spending a lot of time analysing the composition of my runs over the last week or so, I have decided to add another target to the schedule. Currently, the only target I have is TOTAL MILEAGE. My next running week, for example (Week 37, 12th July), will see me attempt a total mileage of 95 miles. Starting from that week I will factor in the AVERAGE DISTANCE PER SESSION to the schedule. This stat so far has been around about the 7 mile mark. I'll be looking to increase this over the next 6 months to an average of 14 miles per session. In other words, every time I go out I should be looking to be run just over a half marathon in distance! Of course, I'll be doing this within the constraints of the total mileage required for the week. This figure has been increasing steadily towards 110 miles a week and I should reach that by mid August. So lets get this straight in our minds. 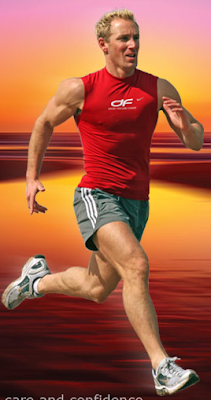 By December 2009, I will be running 110 miles every other week and each run will be around 14 miles in distance. Wow! That's a far cry from the amount of running I did in preparation for the 874 mile jog from John O'Groats to Lands End in 2007. I should emerge a better runner as a result of the new target with a greater range and increased endurance. The other "tweak" to the schedule will be seen in the cross training week. This is a more straightforward one! Quite simply, I will be allowing myself one single rest day as opposed to the 2 or 3 I'm currently enjoying. I feel that I'm just not doing enough sessions during the cross training weeks and I must change this. I wouldn't even rule out doing further running during these weeks. These 2 tweaks will certainly increase the difficulty and hopefully the intensity of my training. With so many other day to day things to fit in, not to mention the planning and organisation of the USA 2011 run, there is very little margin for error or slip up. I wouldn't want it any other way! A disappointing end to a tough week 33! 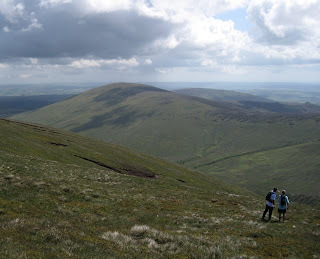 The start of week 33 saw me attempt a 14 mile route in the Cheviot Hills with Mike Lewis and Paul Bradbeer. Now I've ran some tough routes in my time but for me this was a new definition of difficult! 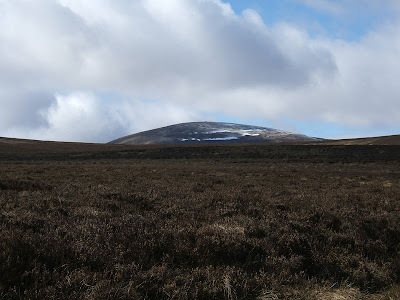 The route involved climbing up The Cheviot summit itself which stands at 2674 ft and the neighbouring Hedgehope Hill at 2340 ft. The elevation didn't prove too difficult by itself. I've ran up and down many hills (and steps!) during this training campaign so I wouldn't expect anything different. It was, however, the terrain on which I was running that caused me as many problems on a run as I've had in a long old while. Straight forward paths were few and far between and for the most part it was a case of "wading" through heather and lots of rough overgrown uneven terrain. The near constant jarring action on my ankles was nothing I've ever experienced before. I was running like a cross between a drunken Elvis and a new born Bambi! The air was blue in the Cheviots that day I can tell you! While clambering down the other side of The Cheviot I was beginning to question the seemingly ludicrous decision to enter the Chevy Chase on July 4th. I think I also realised why Jimmy Bell said "Never again" after he ran this race a few years ago. Although he did come back and do it again a second time! All of a sudden my respect for Fell Runners increased many times over. I found I neither had the courage nor the technique required to descend a hill such as The Cheviot in a respectable time. I will definitely be up against it when I try and beat the 6 hour cut off time on July 4th! This particular attempt took just over 5 hours and was 6 miles short of the full distance! You don't have to have a GCSE in maths to work out that I probably wouldn't beat the cut off time with this kind of performance. The fact that I ran out of water after 9 miles didn't help matters either. That's no excuse though! I will be returning to have another go at it by myself on the 27th June. I won't be stopping to take photos this time and I'll be armed with my trusty iPod. It'll be a case of head down and get on with it! I'll go into the next attempt better hydrated than last week and will try and use the 1.5 litres of water that I'll be carrying sparingly. 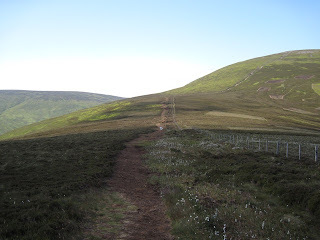 Last weeks run in the Cheviots was the first of what should have been 95 miles. By the time I came to do a few regular runs on Monday I realised that this was a particularly tall order. I felt absolutely shattered. Sunday's effort up and down the rough terrain had definitely taken it's toll, particularly on my quadricep muscles. They never ache! It's usually my hamstrings or calf muscles that ache! I missed 3 scheduled runs between Monday and Wednesday but still managed to clock up 42.7 miles. But they were all very laboured miles and the confidence that I'd gained from last week's Blaydon Race PB was nowhere to be seen! I can't say I enjoyed many of those 42.7 miles and if it wasn't for the usual runners from Northern Rock keeping me company on a few of those runs then I would have struggled even more. Thanks yet again are due to Austin, Colin, Patrick and Carl. One thing to note was the amount of sleep I was having. 12 hours on Monday, 10 hours on Tuesday and 9 on Wednesday! 12 hours! That's unheard of! This dip in confidence didn't last and the 3 sessions on Thursday were a good sign that I'd finally recovered from Sunday's Cheviot adventure. The aches in my quads had gone and I generally felt a lot better. To make life easier I did more miles than I'd planned to do during the first 2 sessions on Friday. This only left 3.9 miles left during the 3rd session which I took easy on the treadmill. Somehow, going into the final day of week 33 I'd managed to run 73 miles and I felt I had a really good chance of getting to the target of 95 miles. The plan was to run the 22 mile Pennine Challenge route on the final day. This never happened though as I woke up with a very sore throat and a bit of a head cold. I put off and put off running until finally making the decision to quite at 6pm. I was quite prepared to start the 22 miles that late but it wasn't to be. Another thing that affected my decision was the need to be in ship shape for the next attempt in the Cheviots next Saturday. The Chevy Chase has been a bit of a distraction from my USA 2011 training. Is it a welcome one? I think the answer to that is yes! One thing is for sure, running on that kind of terrain certainly makes my regular running feel a whole lot easier and straightforward. I take my hat off to those hardy fell runners. Some of whom may be reading this and having a bit of a laugh. I'm not too embarrassed by lack of fell running technique or even by my constant complaining this week. What will be embarrassing though is not beating the 6 hour cut off time on July 4th! The plan last week was to go straight into 100 miles this week but I need to focus on the Chevy Chase. This week (34) will just involve a session in the gym with Mark Fleming before a 2nd attempt at 14 miles in The Cheviots. I'll have another session with Mark in week 35 before the Chevy Chase at the end of the week. I may well have another gym week after that before attempting 95 miles again in week 36. It's all subject to change but if all goes to plan then I should be running 110 miles per week by mid August. This is approximately half of the weekly mileage that I'll be running in the USA in just under 2 years time. Sunday 14th June – 14 mile run, The Cheviot and Hedgehope tour. (05:03:00). Monday 15th June - 7.6 mile run, West of Gosforth Tour. (01:07:52). Monday 15th June – 3.5 mile run, Treadmill. (00:32:59). Tuesday 16th June - 7.3 mile run, St James’ Park. (01:10:48). Wednesday 17th June - 10.3 mile run, Havannah and Race Course. (01:41:30). Thursday 18th June – 5 mile run, Treadmill. (00:44:55). Thursday 18th June – 5 mile run, Race Course. (00:44:00). Thursday 18th June – 5 mile run, Treadmill. (00:48:28). Friday 19th June - 5.5 mile run, Treadmill. (00:52:01). Friday 19th June - 5.9 mile run, Around the Sage. (00:50:52). Friday 19th June – 3.9 mile run, Treadmill. (00:35:58). A tough but enjoyable end to week 32. After Tuesday's PB in the Blaydon Race, confidence was very high going into Thursday's personal training session with Mark Fleming down at David Fairlamb's gym. Body stats were measured at the start of the session and I was pleased to learn that more fat had been lost and more lean weight gained. Moreover, my metabolic age is now down to 32! Regular readers will remember that it was 52 when I started training! Half an hour in to the session, though, and my feet were brought firmly crashing down to the ground with a very tough workout indeed! Chin ups and various dips were on the menu early on and I was left shaking after that lot. I almost passed out during the interval session on the step machine. What a tart! 90 minutes later though I left the gym feeling invigorated after a really tough workout. These 90 minute sessions also gives Mark and I a good chance to talk about preparations and training for the USA. Although, there were times today when simple conversation was beyond me! The follow up session, 24 hours later, involved more weights and I felt I coped a bit better than the day before. I wouldn't do half of the required work in the gym without a personal trainer and I would recommend one to anyone with motivational problems or who, like me, someone who likes to be really pushed to the limits in the gym. Why not check out David Fairlamb's website for more details. That's him pictured up above there. The results that I've seen in some of David's clients are remarkable. Peter McCowie is one example. Peter was over 20 stone when he started training in November. I remember his first Beach Bootcamp where to say he had to take it easy was an understatement. Peter is now 14 stone something and completed the Blaydon Race last week in 46 minutes. As I said - REMARKABLE! 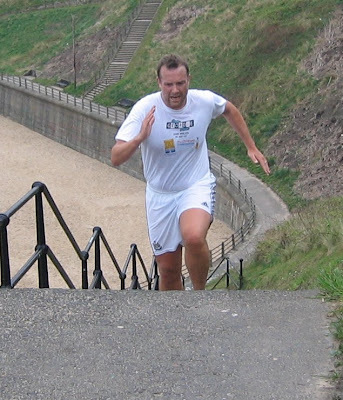 That brings me nicely on to Saturday morning, where I attended my first David Fairlamb's Beach Bootcamp in 4 weeks. Lots of running and the recent bike ride has kept me away but it was great to be back with both David and Mark Fleming overseeing the proceedings. David's section was mostly cardio on the beach section and Mark's was more concerned with resistance training in the old outdoor swimming pool area. As per usual, it was a brilliant session and it was topped off with 10 lots of steps in King Edward's Bay afterwards. What a great way to end week 32 of the USA 2011 training schedule! Tuesday 9th June - 6 mile run, The Blaydon Race. (00:46:48). Thursday 11th June - Personal Training Session. (01:30:00). Friday 12th June - Personal Training Session. (01:30:00). Saturday 13th June - Beach Bootcamp. (00:45:00). Saturday 13th June - 10 x steps. ..away we went along Collingwood street, that's on the road to Blaydon! Oh me lads! You should have seen us gannin! Well it's the 9th June, which can only mean one thing; my annual participation in the Blaydon Race. 3 years ago I clocked 00:58:59 in this race. 2 years ago my time was 00:52:53 and last year I managed 00:51:32. The aim this year was to beat 50 minutes and I'm pleased to report that I finished well within that target with a time of 00:46:48. I started the run just how I intended to go on with a faster than usual pace for me. I was never in any distress or trouble throughout the entire run and felt in total control the whole time. I think this pace was just about right for this stage of my training. I did wonder if yesterday's sports massage would have an adverse effect on my legs but in fact the opposite was true; my legs felt as good as they have for a long time. Although they are still very sore to the touch after Tracy from the gym had a right good go at them. Ooya! The final time was particularly pleasing given that it was done with only 2 rest days following that tough 90 mile week of running. I'm already looking forward to next year's run when I'll have ran nearly another 2800 miles by then. I've got to be looking at a sub 45 minute time next year! 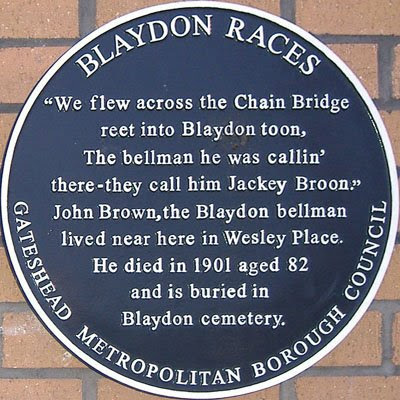 While I'm on the subject of the Blaydon Races, why not check out a rather brilliant version of that famous song on the Exiles Myspace page. Regular readers will know that The Exiles (aka Alan Millen and Tim Readman) are in the process of producing 2 charity songs for Run Geordie Run. The delivery of the songs are imminent and I can't wait to hear Runner on a Lonely Road and Beneath The Angels Wings Once More. I'll keep you posted as and when I get further news on the songs. In the meantime, click here to be taken to The Exiles page where that catchy version of The Blaydon Races awaits. The Chevy Chase doesn't fit nicely with my training schedule so I've decided to change things round a bit. This Sunday will see me start a 95 mile week as planned. Once that is over, however, I intend to get straight into the 100 mile week. So that's 195 miles to be ran in 14 days. Ooya! I'll then enjoy 6 full rest days before taking part in the 53rd Chevy Chase on Saturday the 4th of July. Pictured is one of the summits of the route (The Cheviot) standing proud at 2674 ft.
After the Chevy Chase I'll have a week in the gym before attempting 105 miles the following week. If all goes to plan with that then I'll have a crack at 110 miles in the last week of July. I should be back in some kind of routine after this, with a week in the gym followed by a week of running 110 miles, etc etc. I should learn a lot about what I'm capable of over the coming weeks and months. Quality running is what I'm after. As soon as the quality goes then I'll reduce the mileage and come back stronger until I can do it properly. That's not going to happen without one hell of a fight though! Run Geordie Run indeed! Thank you to Brooks Sports again! Thanks, once again, are due to Brooks Sports for sending me 2 new pairs of my favourite Glycerin 7 shoes and a pair of Cascadia 4 trail shoes (pictured). The trail shoes will be getting their debut this Sunday in the Cheviots and will be used to run the 20 mile Chevy Chase on July 4th. They also give me the option of taking my training off road and further into the Pennines over the coming months. Brooks Sports have given me great support so far and their help really is appreciated. This will, of course, sound like a bit of a sales pitch but I have never looked back since wearing Brooks shoes. They are the shoes that got me safely through 874 miles of running from John O'Groats to Lands End in 2007. If you'd like to try Brooks shoes for yourself then why not get yourself along to Northern Runner, 52 Low Friar Street (Just down from the Gate), Newcastle. If required, they'll take a good look at your feet and will always recommend the best shoe for your foot type. And don't forget to tell them I sent you! Week 31 - 90 miles done! After last week's 120 mile bike ride to Bamburgh and back, I decided to rest on the first day of week 31 of training. At the time, I wasn't sure if this was the correct course of action to take. By taking a rest day, I would have to run 90 miles in 6 days. That's 15 miles a day! Tough by anyone's standards. The first run of the week was therefore on Monday with Patrick, Colin and Austin. That run passed incident free but I could really feel the bike ride in my legs. In fact, I had the same heavy legged kind of feeling until the last run on Tuesday. I think it showed in my running too with an average pace of 00:09:07 per mile for the first 4 sessions of the week. Never mind though, I was still managing the required 15 miles a day. Wednesday saw 3 shorter session of 5 miles each. I thought that this would give me the chance to get the total average pace down to below 9 minutes per mile but it was not to be. I was stuck on 00:09:07 at the half way point of the week. It was going to be a big ask to beat week 29's average pace of 00:09:04. With 45 miles done and 45 left I suppose all I was really concerned about was getting all of the miles done and running further in training than I had ever run before. Rubbish! I wanted to beat that previous best pace! On Thursday I had a great little run to the north of Gosforth. I didn't really plan on where I was going to run beforehand and just set off north with the intention of exploring Wideopen and Wheetslade Country Park. I remember Jimmy Bell setting off on this type of run and now I've got a decent range it really does help get over the boredom to just get out there and run where the mood takes you. I managed 9.5 miles that lunchtime. I would have been out for much longer if I didn't have to return to the office. That long run only left 5.5 miles to be done on the evening session. That session wasn't without incident though as I set off full of confidence at a blistering pace on the treadmill. 1.5 miles in and I found that I had no energy at all. In running terms I "treaded water" for the next 3 miles. This was doing my average pace no good at all and I somehow managed the last mile in 00:07:30. I was shattered at the end of this session but pleased to have salvaged a decent time of 00:49:40 for 5.5 miles (00:09:01 per mile). 12 hours later at 7 am and I was back on the treadmill for a 4 mile run. This one was really slow and left the average pace for the week at 00:09:08 per mile, some 5 seconds away from where I needed to be. At this point I realised it would take something extra special to beat 00:09:04 per mile. So step up Colin Moore and Patrick Aynsley-Smythe to set a decent pace around the so called "Mark Allison Memorial 6 miles" route. So called, as it's my favourite route and takes in my birthplace; Princess Mary's Hospital. The lads did a brilliant job to get me round in 00:49:29. This was only the second time I've recorded a sub 50 minute time for this route. The last mile was done in 00:07:26 which wasn't bad considering it was mile 70 of the week! This run got the average pace down to 00:09:04 for the week which equalled the previous best set in week 29 for 85 miles. The final session on Friday was very much like the previous day's final session where I ran out of energy. Fortunately, it didn't happen until 3 miles in and the final time of 00:44:44 was enough to get the average weekly pace down to 00:09:03 per mile. Brilliant, after 75 miles I had beaten the previous best pace. It's a pity there were 15 miles left to run the following day! I left the final run of the week until tea time on Saturday. The 15 mile route took me out of Shotley Bridge, down the Derwent Walk, through Rowlands Gill and back to Shotley Bridge along the A694. Energy levels were pretty good but my legs, once again, were quite heavy. The final time of 02:38:15 gave me a final total average pace of 00:09:18 for the week. Someway short of the previous best, but nevermind. What will stay in my mind for a long time to come will be the relative ease in which I ran the final few miles of the week. From about mile 84 - 90. It wasn't a fast pace but it was really comfortable and it gave me some time to reflect on what I've achieved so far. This week alone, I've managed to run 90 miles on the back of a tough 120 mile bike ride. The total mileage for this campaign has now broken the 900 mile barrier. In 2 weeks time I'll pass through the 1000 mile barrier! All of this is new ground for me. This blows the training plan I had for John O'Groats to Lands End right out of the water. In a way I'm looking forward to reaching 110 miles per week where I can start to compare like for like weeks and focus on running better each week over similar distances. Mind you, 110 miles a week will mean running nearly 16 miles a day. That could be 18 hours of running a week! Phew! After all of that I've got 2 rest days before I attempt to beat my PB for the Blaydon Race on Tuesday. I have another rest day after that and then 2 personal training sessions with Mark Fleming on Thursday and Friday. I'll be attending Beach Bootcamp on Saturday before doing a bit of exploring on the Chevy Chase route on Sunday at the start of the 95 mile week that is week 33. It's relentless to say the least. But as ever, I'm well up for the challenge! Monday 1st June - 7.2 mile run, West of Gosforth Tour. (01:05:18). Monday 1st June - 7.8 mile run, Treadmill. (01:09:50). Tuesday 2nd June - 6.9 mile run, Race Course, Brunton, Bridle Path extension. (01:02:53). Tuesday 2nd June - 8.1 mile run, Gosforth tour. (01:15:40). Wednesday 3rd June - 5 mile run, Treadmill. (00:44:55). Wednesday 3rd June - 5 mile run, Race Course. (00:46:25). Wednesday 3rd June - 5 mile run, Treadmill. (00:44:58). Thursday 4th June - 9.5 mile run, West of Gosforth Tour. (01:27:20). Thursday 4th June - 5.5 mile run, Treadmill. (00:49:40). Friday 5th June - 4 mile run, Treadmill. (00:38:04). Friday 5th June - 6 mile run, Town Moor. (00:49:29). Friday 5th June - 5 mile run, Treadmill. (00:44:44). 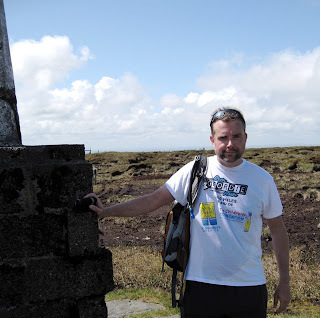 Saturday 6th June - 15 mile run, Shotley Bridge to Rowlands Gill and back. (02:38:15). Week 31 - A success! 90 miles done! Expect a full review later today. Bike ride to Bamburgh (and back)! Friday saw me initiated into a band of intrepid cyclists who go by the name of "THE MEN OF STEEL". Pictured at the start from left to right are Mark Fleming, Steve Harrison, Martin Ibbotson, Me, Jack and Ben Lavan. These guys raised over £50,000 for The Northern Brainwave appeal 2 years ago and I was delighted to be able to join them on their latest trek from Gosforth to Bamburgh and back. This 120 mile trip over 2 days was mild in comparison to their previous rides, which was just as well considering I haven't ridden my bike since December! The scenery was absolutely breathtaking on the way up the coast and the weather was scorching. I didn't take much convincing to have my first beer in exactly 9 months. My thirst was well and truly quenched in Bamburgh on Friday night! One of the highlights of the trip was a stop at Mark Fleming's Aunty Carol's house where a feast of home made burgers with all of the trimmings was waiting for us. This stop was at the 108 mile point on the route and the last 12 miles were done with plenty of energy in the tummy! Me: "Hey Steve, are those t-shirts available to buy?" Steve: "Yes, only £10 and the full £10 goes to charity." Me: "Wow! The full £10." Steve "Yes the full £10." Me: "Brilliant. I might get one of those now I know the full £10 goes to charity." Steve: "And they are available to buy tonight! Here in Bamburgh!" Me: "No way! Brilliant! Available to buy tonight and the full £10 goes to charity!" Once the above was repeated 20 or so times, Ben and Martin had little choice but to part with their hard earned cash. But hey, all for a good cause! I found the ride quite tough (or at least my backside did!!) and their were some nice little climbs on the 2nd day. Energy levels were quite high throughout and the lads even let me form a breakaway without giving too much of a chase in the hills on the 2nd day. Consider my morale boosted after that! The downside of the ride though was that I was too tired to run yesterday. This means that I now face running 90 miles in 6 days! I got the week off to a flyer today with a 7.2 mile run at lunchtime and a 7.8 mile run after work. Thanks go to Colin Moore for dragging me round on a very hot day and helping me navigate through a twisty turny kind of a route. Patrick and Austin were in there too somewhere. They didn't hang about though! I'm already looking forward to next year's bike ride. That will probably be my next beer too!